Aghoreshwar Bhagwan Ramji, a renowned Aghor saint of India, lived his life in service to all, and has left behind him a simple path to achieve what he himself accomplished in his lifetime. Baba, as he was known and addressed to by most of his devotees and disciples, has a Life Story that is inspiring to spiritual seekers and laymen alike. After attaining enlightenment at a very young age Baba established an organization for social service, Sri Sarveshwari Samooh, with its headquarters in Banaras. The Samooh first opened a hospital for leprosy patients and then went on to fight the dowry system, simplify the wedding ceremony and work for education of the poor. Today there are many Ashrams and centers in India and abroad engaged in continuing the ideals and teachings of Aghoreshwar. Aghoreshwar Mahaprabhu Bhagwan Ram was born on the 12th of September, 1937, in the village of Gundi, near the town of Arrah, in Bihar state of India. Even today Gundi is a beautiful village abounding with mangroves, guava trees, groves of peepal and vat trees, lush green fields with the distant sounds of water being pumped into the channels and a serenity in the atmosphere that seems to pervade everything that exists within its bounds. There is also a temple to Lord Ranganathan and a Shiva temple that reminds the visitor of the days gone by. But the most famous temple here is known as the Yagyawatar temple, a temple where people say many enlightened saints have stayed and worked for the welfare of the community. Baba was a first-born child after a long wait, and since his mother had an auspicious dream before his birth, his father named him "Bhagwan". Right since his childhood Bhagwan had an insatiable thirst for the divine. At home he would sit alone in a room and sing bhajans, or go out into the groves of trees and spend his time in solitude. Baba lost his father at the tender age of five, and by the age of seven his quest for the divine became so strong that he left his house and began to live in the groves and fields in the village, refusing to stay at home for fear of distraction to his meditations. But that was just the beginning of his quest. Soon he began to travel on foot to various places of pilgrimage. His first journey was to Gaya during the winter season, and since he had adopted the life of a mendicant, he had nothing to even cover himself with at night. Travelling during the day in this way was not very difficult, but his nights used to be cold and miserable. Baba would take shelter among the plants in arhar fields, and subsist on whatever fruits or vegetables nature provided as food. After spending time in Gaya visiting the temples, he left for Jagannathpuri on the east coast of India. Baba went into a state of ecstasy immediately on entering the temple, and while he was performing circumambulation of the deity with two paise clenched in his hands to buy food with, the temple priest hit him on the head and took the money away. But Bhagwan was not deterred. He spent some time at Jagannathpuri and returned back to his village. Bhagwan had divine experiences while back at the village, and his wanderlust continued. At the age of fifteen he came to Banaras. Getting off at the Varanasi Cantonment station he sought the way to the Kashi Vishwanath temple. As he stood on the road, uncertain of where to go, an old woman in a silk saree with a red border came to him and asked him where he wanted to go. When Bhagwan told her he wanted to go to the Kashi-Vishwanath temple she led him to the temple and had him perform the puja as he wanted to. The two then came out of the temple and started walking on the road. The lady entered the temple of goddess Annapurna which, to young Bhagwan, looked like some prosperous person's house, and when the lady did not come he left thinking that must be the lady's house. Young Bhagwan then walked towards the Dehri bridge but before he could reach it he saw the same lady standing there. She asked him again about his visit to Kashi and directed him to a monastery of God-realized seekers, the Kinaram Sthal, in the Ravindrapuri locality of Varanasi. This was the turning point in young Bhagwan's life for soon after he reached the Sthal he took initiation from his guru and became an Aghor seeker. Baba spent many years in sadhana. He wandered as a sadhu from place to place, he undertook various practices until his self realization while he was still in his early teens. After that time he turned his attention towards the society, particularly towards the poor and the suffering who sought him out wherever he turned. Many were relieved of their sufferings just by being in his presence. Words were not necessary. He would not take recognition for so-called miracles, but the beneficiaries knew what had really happened. His love for his fellow human beings was all-encompassing, and it still is. 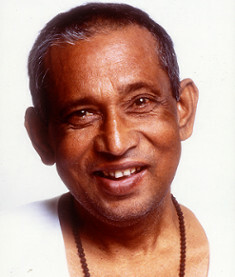 Baba took samadhi in 1992. Fortunately, such beings as Baba do not disappear with the end of the body. They are still available to us on a subtle level, continuing to give their compassionate help to those who turn to them.